My daily trip to the Phoenix Park has become very complicated. 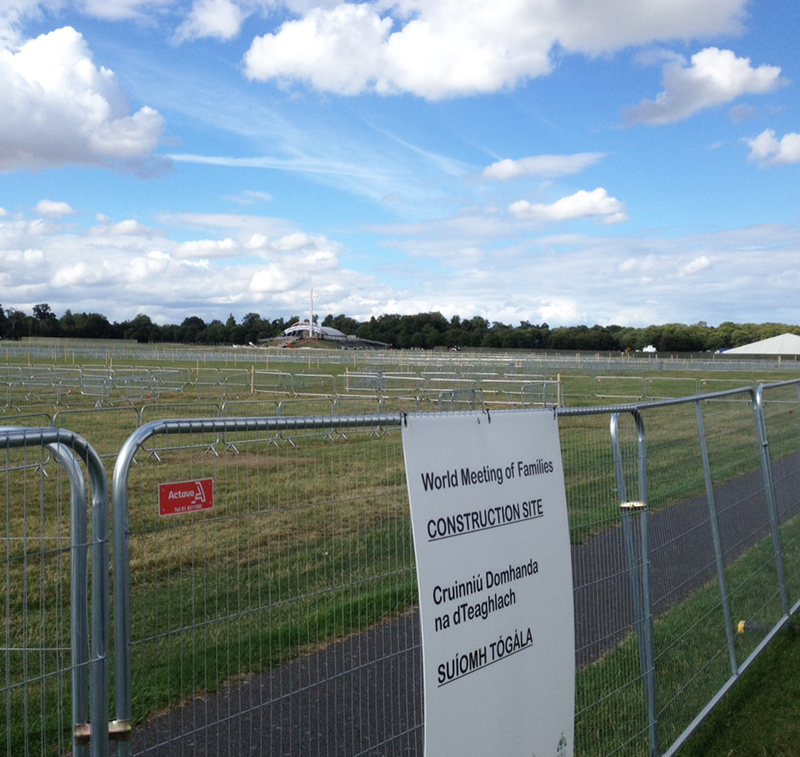 A huge central area has been cordoned off to enable the construction of a venue big enough to hold the expected 500,000 people who will attend a Mass to be celebrated by the Pope. This is taking place on Sunday 26 August. The result of all this activity is that I have had to move my dog-walking start point from the Papal Cross car park to the one on Glen Road. 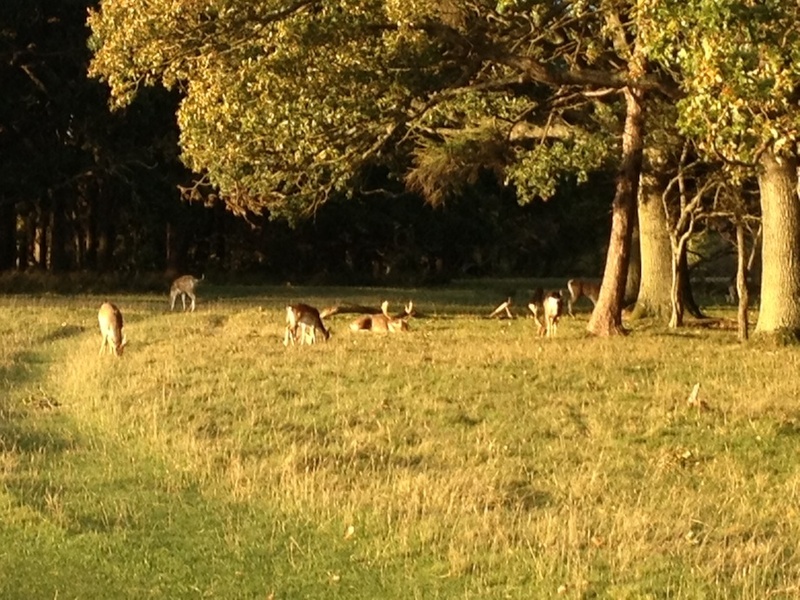 This happens to be the area where most of the females and this year’s fawns from the park’s fallow deer herd hang out. This part of the Fifteen Acres is where the deers would normally be at this time of the year, but they are confined to the eastern part of the space by the temporary fence. My enforced move has meant that I am much closer to the dozens of people who turn up every day to feed the deer, something that is actually prohibited by the park authorities. 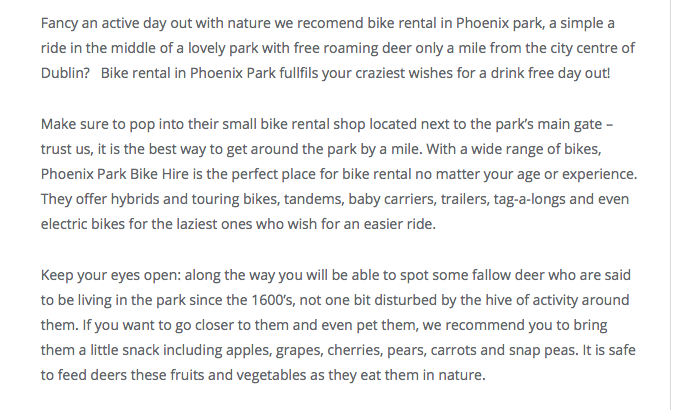 Every day I see several bunches of deer, each surrounded by tourists proffering food – mainly carrots and apples. 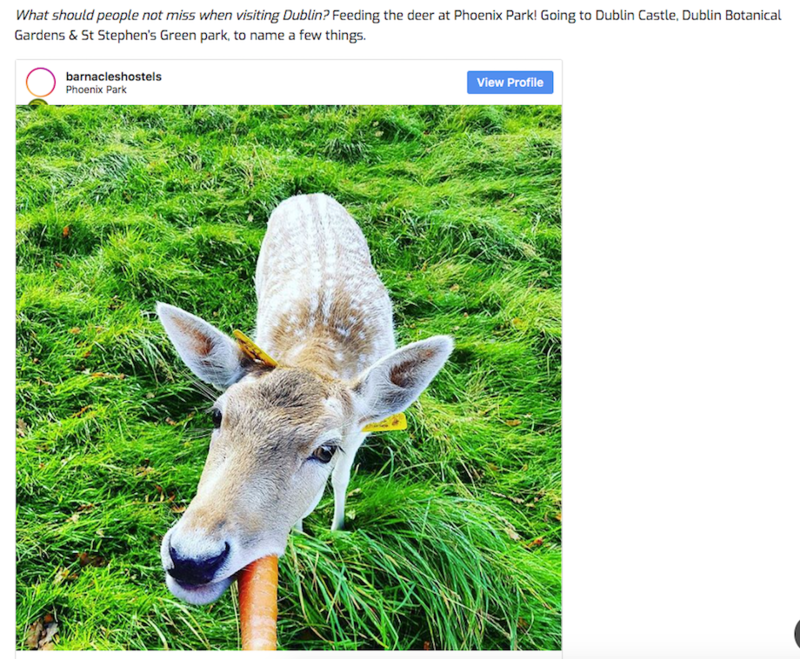 This activity is bad enough (according to the Wild Deer Association of Ireland, even carrots and apples are not good food for deer) but then some of the feeders make things worse by leaving their litter behind. There was a major outcry about what we are doing to our habitat when the Blue Planet TV programme recently broadcast the effect of plastic pollution on the species with whom we share our earth. 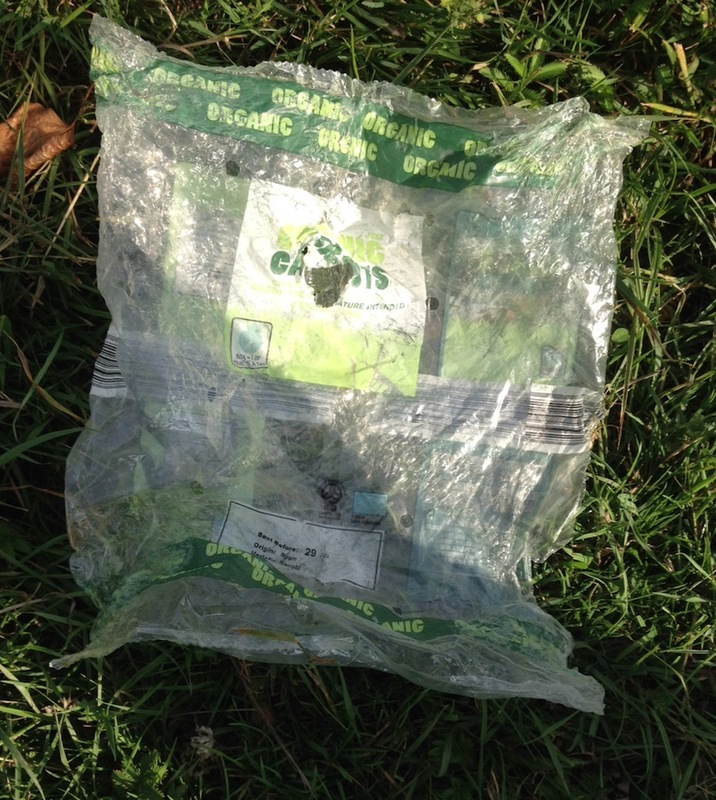 And yet people still leave their rubbish behind in a field where wild animals graze. 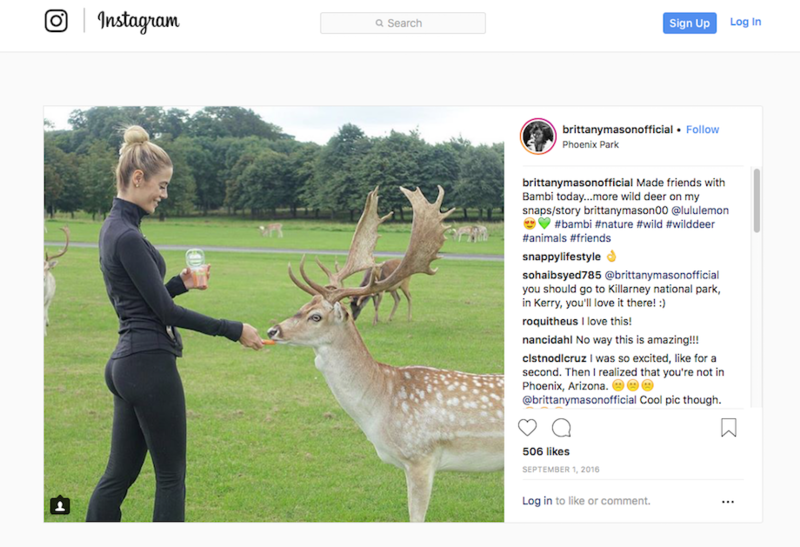 And here is ‘Dublin-based model’ Brittany Mason (whoever she is) delighting her 77,000 Instagram followers with her cute picture. She apparently ‘made friends with Bambi today’, carefully remembering to add her sponsor’s hashtag to the post. I took these examples from a very good piece posted in 2016 on the Dublin Inquirer site, and there are many more horrifying pictures there. Some proper research needs to be done on the effects of this rapid increase in feeding. 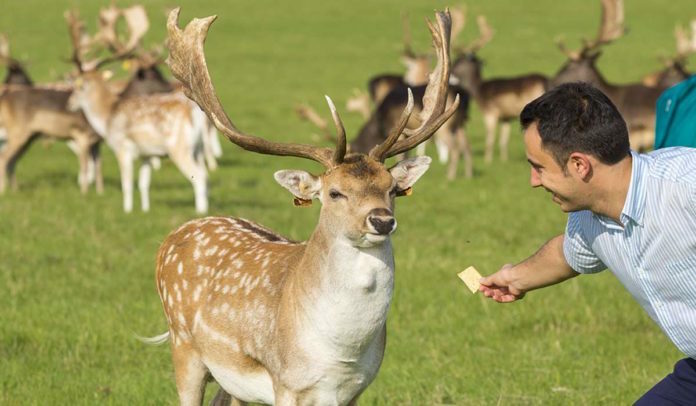 According to a recent Mooney Goes Wild radio programme, where one Spanish student was found to be giving the deer popcorn, Laura Griffin from UCD is looking at the subject. I hope that this will be published soon, and perhaps then the OPW will take a much more active stance on prevention. In the meantime, maybe people will realise that the deer are wild and really shouldn’t be approached. Particularly during the annual rut, which will start in a few weeks time. Here is a piece which appeared in the Irish Sun, written in the usual sniggery language we have grown to expect. This is the scene in the Phoenix Park in Dublin less than 24 hours after ex-Hurricane Ophelia had the whole of the island of Ireland on red alert. Along Chesterfield Avenue, the main road through the park, there are many branches and a few whole trees down. 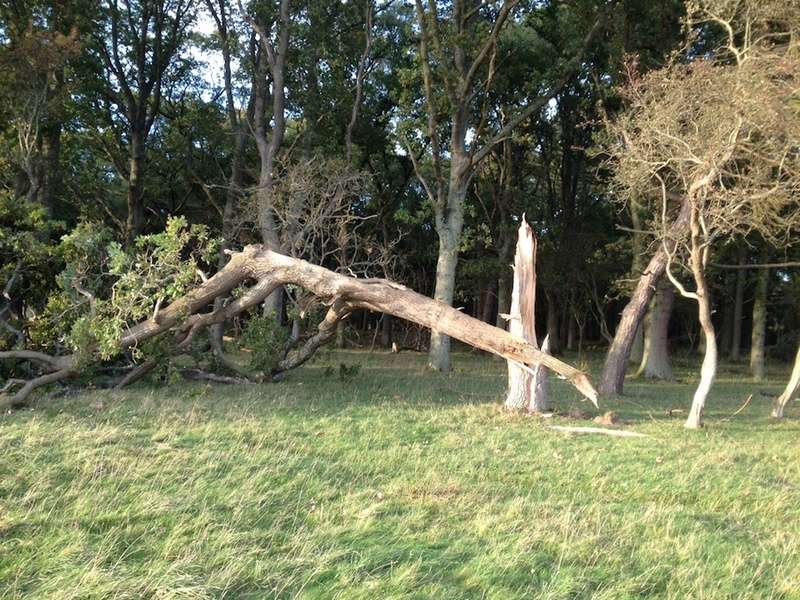 Here, in the Oldtown wood area, a small beech tree has fallen to the ground. It doesn’t look to me as though it will pose any danger to anyone where it lies, so it will be interesting to see what the authorities do when they come round to assess it. 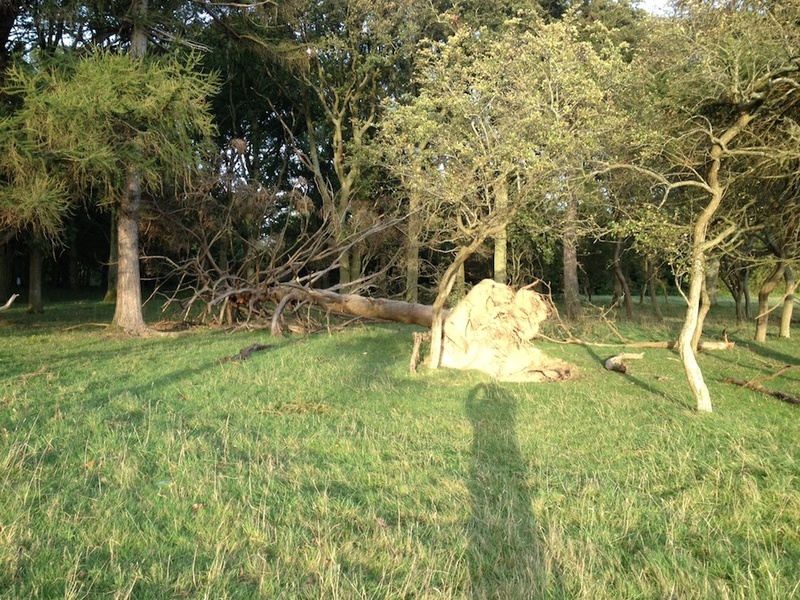 Nearby, a large Scots pine has lain unmoved for nearly two years, since it fell victim to Storm Frank in December 2015. People regularly climb on this massive trunk and I’ve even seen dogs running along it. But it’s obviously been left to go through the same process of natural decay as it would do in a normal forest. A good way of increasing the biodiversity in the park. Meanwhile the park’s resident herd of fallow deer are getting on with what matters to them most at this time of year, which is the rut. A hundred yards from the fallen tree a small group of hinds were hanging out with a single stag. The stags started moving over to this side of the park a few weeks ago. Once the stags have sorted out a harem for themselves and mated with the hinds as they come into season, they will up sticks and move back to the other side of the park. By Christmas the all-male bachelor herd will be reformed. At the moment, it’s a bit like a teenage disco as the lads strut about bellowing and locking horns with each other in an attempt to impress the ladeez. The ones who don’t get a date sit around in the long grass looking forlorn.